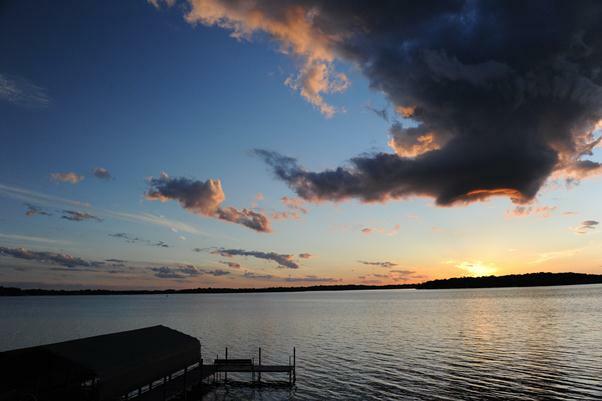 possible 500-year flood from near Duluth into northwest Wisconsin. 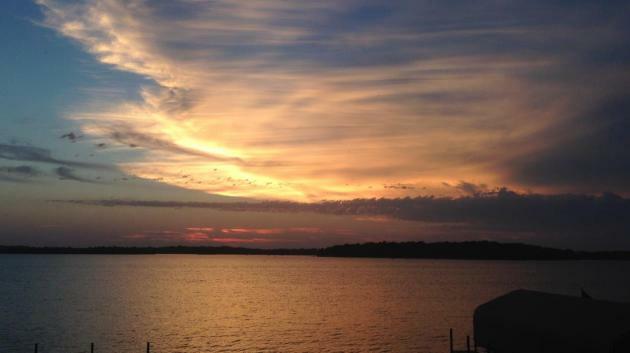 Farmers in southern Minnesota are shaking their collective fists at the sky. The pattern has been supernaturally persistent, with a parade of slow-moving storms soaking southern counties, week after week. 1-2 month's worth of rain fell this week, with over 4 inches at Fairmont and 7 inches at Luverne. There is standing water in many fields. Farmers have good reason to be concerned. I see a dry sky today with sunshine spilling into much of the weekend. A stray storm may bubble up Sunday, with more numerous and heavy storms arriving Monday and Tuesday. Enjoy this comfortable front, because ECMWF guidance hints at highs well up into the 90s next weekend. At the rate we're going we may wind up with 20-25 days or more above 90F this year. Average for an MSP summer is 13 days. The outlook calls for more hot flashes. Another Surge of Heat. And just in time for the 4th of July for much of America! The only comfortable spots: New England and Pacific Northwest, otherwise it looks like a streak of 90s, even some 100-degree heat for the Plains. 90-Day Temperature Outlook. NOAA CPC predicts a significant chance of warmer than average temperatures from July into September for much of the western USA and New England; flip a coin for Minnesota and the Upper Midwest. 90-Day Rainfall Trend. NOAA CPC shows a higher probability of a wetter second half of summer for the Mid Atlantic and the central and southern Rockies. We continue to watch the potential for more heavy rain across parts of southern Texas today, with the potential of another 1-4” of rain over the next 12-18 hours. Rain should begin to taper off by tonight, however, as the disturbance responsible for the heavy rain starts to move out of the region. Flash Flood Watches continue to be in effect through the evening hours across southern Texas where this additional rain could cause flooding issues, especially in areas that have observed flash flooding over the past several days. Past 6 Hour Rain. 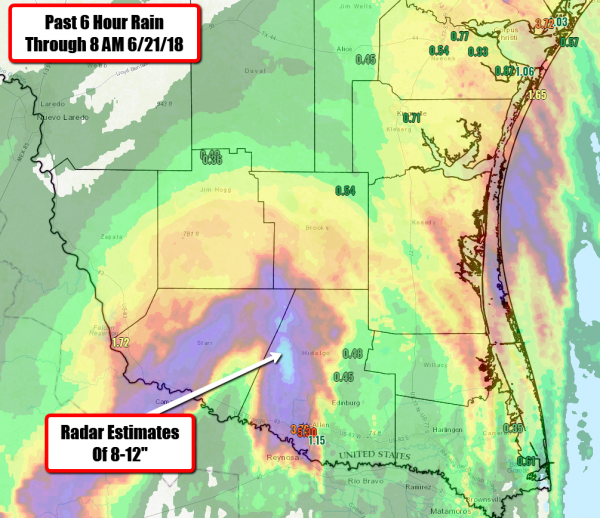 Heavy rain continues to fall across parts of southern Texas this morning, with over 5” of rain observed in a six-hour period through 8 AM in Mission and radar estimates of 8-12” west of Hidalgo. This heavy rain continues to bring the potential of flash flooding to the region today. Flash Flood Warnings This Morning. 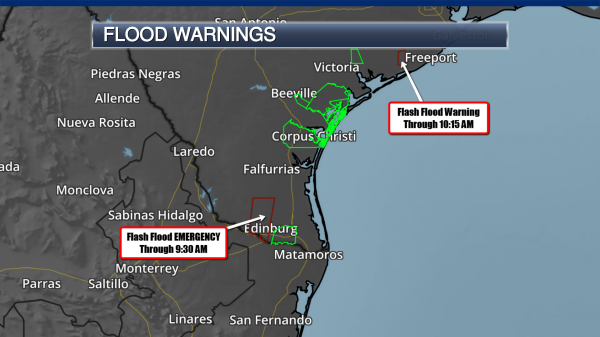 As of 8:40 AM CT there were two Flash Flood Warnings in effect across parts of southern Texas, including a Flash Flood Emergency for south-central Hidalgo County until 9:30 AM including McAllen and Hidalgo. According to the warning, 3 to 5 inches of rain has fallen with an additional 1-3” possible. Flash Flood Emergencies are more serious and life-threatening than traditional Flash Flood Warnings, as they are indicative of widespread flash flooding that will cause significant/catastrophic impacts to property and life. Map credit: AerisWeather and Praedictix. More Heavy Rain Today. Today the heaviest of the rain will be situated across southern Texas, including areas like McAllen, Corpus Christi, and Brownsville. 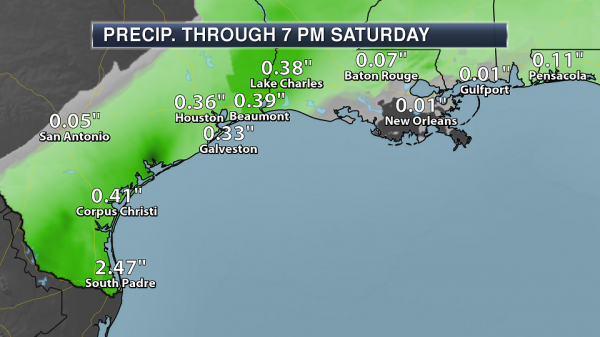 Across these areas, rainfall amounts of 1-3” are expected, with isolated amounts of up to 4” possible. The disturbance responsible for this heavy rain will finally move out of the region as we head through the day and into tonight, meaning rain will finally start to taper off across heavily hit areas in the next 12-18 hours. Flash Flood Watches. 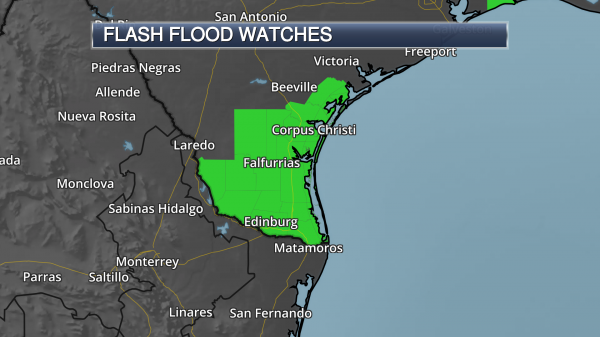 Flash Flood Watches continue across southern Texas through the evening hours for the potential of more heavy rain that could lead to flash flooding across the region, especially in areas that have observed flash flooding in the past several days. Unprecedented Change From Cold April to Hot May. Brian Brettschneider has the details at Forbes: "...If the whiplash from cold to hot seemed unusual, it was. In fact, it was unprecedented for any time of year. Using the NASA GISS temperature gridded data set, approximately 130,000 square miles went from record cool to record warm from April to May in 2018. The next largest "event" was the transition from record cold to record warm from December 1946 to January 1947, in the tropical Pacific Ocean southeast of Hawai'i (107,000 square miles). Given that it occurred over the ocean, I find this a little dubious..."
Map credit: "Global occurrences of a climate station recording the coldest April on record followed by the warmest May on record." There are about 25 million lightning strikes in the U.S. every year. Lightning kills an average of 47 people in the U.S. every year. Lightning travels at about 1/3 the speed of light. An average lightning strike contains 300 million volts of electricity. The odds of being struck are 1 in 400,000 for every year of your life..."
Trump's Pick to Lead Weather Agency Spent 30 Years Fighting It. Bloomberg Businessweek has some background and perspective; here's an excerpt: "...After the bill’s collapse, Barry, now AccuWeather’s chief executive officer, took a more conciliatory approach, proselytizing about the need for all parties involved in forecasting—the government, academics, businesses—to collaborate. Yet he remains a champion of limiting the agency’s public role, opposing its use of social media to spread warnings. “We fear that he wants to turn the weather service into a taxpayer-funded subsidiary of AccuWeather,” says Richard Hirn, attorney for the National Weather Service Employees Organization. Myers may soon be in a position to do that. In October 2017, President Trump nominated him to be NOAA’s administrator. In December the Senate Committee on Commerce, Science, and Transportation, which oversees the NWS, approved him on a party-line vote. “If confirmed, I think he will serve as an outstanding administrator,” Senator Patrick Toomey, a Pennsylvania Republican, said when he introduced Myers at his November confirmation hearing..."
Hurricane-Proof Homes Are Real. Why Isn't Anyone Buying Them? Bloomberg has an interesting story: "...Of the roughly 800,000 single-family houses built last year, the Census Bureau reports just eight percent had concrete frames — one of the main ways architects and engineers toughen structures against extreme weather. Even more basic advances have been slow to get adopted. The Insurance Institute for Business and Home Safety, an industry research group that Wright now heads, created a set of construction standards in 2008 called “Fortified,” which exceed the building code to certify at a minimum that a home’s roof won’t fly off or leak in a hurricane, regardless of its material. In 10 years, only 8,126 U.S. homes have achieved that designation..."
Photo credit: "At developer Eric Soulavy's condominium project in Key Largo, Florida, prices start at $5 million." Photographer: Alicia Vera/Bloomberg. What Alabama Can Teach You About Storm Resilience. Next City has an encouraging post - here's an excerpt: "...He’s not just talking about Alabama. “How should Puerto Rico, Haiti, the Virgin Islands, Key West build back?” says Schneider. “Should we build back cheap, and let it blow away again, or should we build it up, or not build back at all?” Schneider believes it’s a decision every community should make for itself. To that end, in 2009, he founded a nonprofit, Smart Home Alabama, with some of his own money and a grant from the Mississippi-Alabama Sea Grant Consortium, a federal/state partnership. He wanted to introduce a framework for a community who “couldn’t spell resilience” to eventually embrace it. Schneider wanted insurance agents and local builders to start talking. If builders constructed resilient buildings that could withstand more damage, and insurance companies agreed to reduce premiums for more weather-resilient homes, it would incentivize resiliency for homeowners..."
Photo credit: "A new home under construction in coastal Alabama, being built to modern storm resilience standards." Photo by Emily Nonko. After Hurricane, Would You Prefer AC or a Charged Cellphone. Survey Answer May Surprise You. Sun Sentinel has an interesting story - here's an excerpt: "In the hot and dirty days after a hurricane sweeps through Florida, which conveniences would be most important to you? According to a new hurricane preparedness survey commissioned by the FAIR Foundation, internet access would be one of the most-missed amenities. Asked to choose which of two conveniences they would prefer in the four days after a hurricane, 83 percent of respondents chose web access to cable TV access, which was preferred by 17 percent. Sorry, CNN and Fox News. Apparently most respondents would rather surf the web while using rabbit ears to watch local TV..."
The Weather Channel's Mixed Reality Tornado Lesson Was Actually Fun. So says Engadget, which links to a video that integrates immersive reality: "This morning, The Weather Channel debuted the first of its upcoming slate of immersive, mixed reality (IMR) content that's meant to let "viewers truly see the weather like never before". In this segment, meteorologist Jim Cantore explained the Enhanced Fujita (EF) scale that's used to categorize tornadoes. Throughout the 7-minute segment, he dodged faux flying debris and falling cars, making the segment seem not only more relatable, but also entertaining. I wasn't expecting to be as engrossed as I was when I started watching the show. In fact, the first time the IMR effects appeared, I actually laughed at how ridiculous it looked..."
The Future of Television? Is this a fad, like 3-D was, or a trend? More perspective on immersive television from Capital Weather Gang: "...The Weather Channel announced its partnership with the Future Group, an augmented-reality technology company, in April. The products these companies are building together allow two worlds to merge into one broadcast. The new technology allows people to interact with digital objects that become a part of the studio environment. Mike Chesterfield, director of weather presentation at the Weather Channel, spearheaded this months-long effort that culminated in what viewers saw Wednesday. He plans to implement the technology in 80 percent of the Weather Channel’s live programming by 2020. 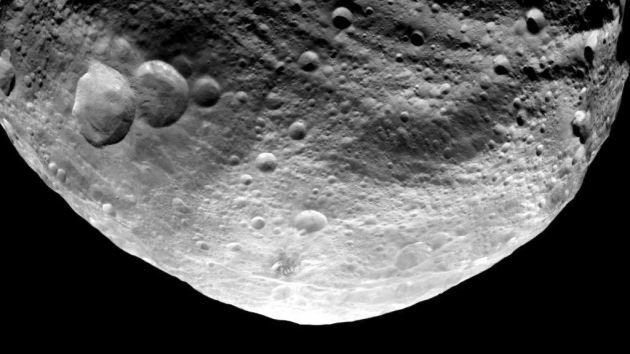 “We want to transport our audience into the heart of the weather,” said Michael Potts, vice president of design for the Weather Group..."
NASA Can't Find Most Asteroids That Might Hit Earth. Other than that things are going quite well. Quartz explains the ongoing risk, and what can be done about it: "...The bad news? NASA is not going to be able to find all the asteroids big enough to cause serious devastation on Earth by 2020—or even 2033. Also: For a hypothetical attempt to send a spacecraft to divert an seriously dangerous incoming asteroid, we’ll need a ten year heads-up to build it and get it to the asteroid. The good news? They’re working on it. “If a real threat does arise, we are prepared to pull together the information about what options might work and provide that information to decision-makers,” Lindley Johnson, NASA’s Planetary Defense Officer, told reporters..."
Viruses Love What We've Done With the Planet. Quartz explains the paradox: "...Viruses have a straightforward mission: enter cells, reproduce, burst forth, and repeat. The constant copying eventually destroys so many cells, whatever living thing is acting as the virus’s host will fall ill. That’d be one thing—bad, but not devastating—if these viruses stayed the same as they perpetuated. Then we could likely, eventually, create vaccines for all of the viruses that infect humans. But, as viruses copy themselves using the machinery of their host’s cells, they constantly mutate. Inevitably, some of these mutations are advantageous, enabling the virus to, for example, spread faster or infect a new type of host. Thanks to mutations, there are over 200 “zoonotic” viruses that can jump between animals and humans, including notorious infections like HIV, Ebola, hepatitis, hanta virus, and several strains of the flu. These are the ones we’re not ready for..."
File photo credit: "Thanks to us, Ebola has lots of places to live." (NIAID). Some Rivers Are So Drug-Polluted, Their Eels Get High on Cocaine. National Geographic has the story: "Critically endangered eels hyped up on cocaine could have trouble making a 3,700-mile trip to mate and reproduce—new research warns. And while societies have long grappled with ways to cope with the use of illicit drugs, less understood are the downstream effects these drugs might have on other species after they enter the aquatic environment through wastewater. So, in the name of research, scientists pushed cocaine on European eels in labs for 50 days in a row, in an effort to monitor the effects of the experience on the fish..."
Photo credit: "European eels are highly endangered in the wild, and water pollution—including illegal drugs—is part of the problem." Photograph by Wil Meinderts, Buiten-Beeld/Minden Pictures/National Geographic Creative. The Most Important Skill Nobody Taught You. Are we distracting ourselves to death? Here's an excerpt of a thoughtful post at Quartz: "...Fortunately, there is a solution. The only way to avoid being ruined by this fear—like any fear—is to face it. It’s to let the boredom take you where it wants so you can deal with whatever it is that is really going on with your sense of self. That’s when you’ll hear yourself think, and that’s when you’ll learn to engage the parts of you that are masked by distraction. The beauty of this is that, once you cross that initial barrier, you realize that being alone isn’t so bad. Boredom can provide its own stimulation. When you surround yourself with moments of solitude and stillness, you become intimately familiar with your environment in a way that forced stimulation doesn’t allow. The world becomes richer, the layers start to peel back, and you see things for what they really are, in all their wholeness, in all their contradictions, and in all their unfamiliarity..."
100 Greatest YouTube Videos Of All Time. If you have some serious time to waste go ahead and browse the videos listed at Thrillist: "...In compiling this all-important ranking, we traveled back to the dawn of YouTube (2005!) and worked our way forward, amassing a daunting trove of links and whittling them down to the absolute best, funniest, most subversively "online" 100 videos. We largely avoided music videos, web series, tutorials, and sketch comedy, wells so deep they deserve separate rankings of their own. And with apologies to the TGIF theme song guy, we also stuck to bona fide YouTube hits. As you scroll through the cavalcade of videos on this list, you'll encounter viral videos you definitely remember, viral videos you definitely forgot, selections that have aged like fine wines, and a few relics from less enlightened times that, on their own terms, still have merit..."
Is "Gaming Disorder" an Illness? Some Experts Say Not So Fast. A story at WIRED.com caught my eye: "...And at least right now, critics contend, that evidence doesn't exist for gaming disorders. Many existing studies on the subject are of surprisingly low quality. A large number of them are statistically underpowered, relying on small sample sizes, and do little do clarify whether videogames cause psychological problems or are merely associated with them. "Some of these gaming habits are likely coping strategies to deal with other underlying psychological challenges," says Lennart Nacke, director of the Human-Computer Interaction Games Group at the University of Waterloo’s Games Institute. These shortcomings are compounded by a lack of consistency across studies, not only in what they're measuring but how they measure it..."
78 F. high in the Twin Cities on Thursday. 81 F. high on June 21, 2017. Summer Days Are Getting Hotter. The warming signal in Minnesota is most pronounced in late winter and early spring (especially nighttime lows) but even MSP is warming over time. Here's an excerpt from Climate Central: "...Hot summer temperatures are getting more and more of a boost, as the increase in atmospheric greenhouse gases is adding more heat to the atmosphere. In a stable climate, the number of days above and below normal should balance out during the 92 days of meteorological summer, at about 46 each. But the number of summer days above normal has been trending upward in most of the country, with 92 percent of the 244 cities in our analysis seeing more summer days above normal than a half-century ago. Some of the largest increases are in Florida, Louisiana, and Texas..."
Climate Change Sparked the Border Migration Crisis. It was one of many factors, but don't overlook the weather and climate-related triggers to the current immigration crisis, argues a story at Daily Beast: "...The agricultural crisis of the Northern Triangle area isn't something that cropped up overnight, but has been in the making for more than a decade. The Food and Agricultural Organization of the United Nations published a report in June 2016 that described the depth of the food insecurity crisis in the region, leaving 3.5 million people, or nearly 30 percent of the population, food insecure from crop losses estimated to be as high as 90 percent. Why the high crop losses? It’s due to a cycle of severe drought followed by tumultuous rainfall in the region, a pair of extreme weather patterns attributed to El Nino and La Nina. Kicking off in 2015, this latest cycle of El Nino has twisted normal weather patterns in the region..."
Photo credit: Jorge Dan Lopez/Reuters. Too Hot to Handle. Politics of Warming Part of Culture Wars. AP News has the story: "...It is “a core element of Republican identity to reject climate science,” said Jerry Taylor, who for more than two decades downplayed global warming as an energy and environment analyst for the libertarian Cato Institute. Taylor now actively tries to fight climate change as founder of the Niskanen Center, a moderate think tank with libertarian principles. The political shifts haven’t been limited to Republicans. Many liberal Democrats have moved sharply to the left on environmental issues, ignoring nuclear energy as an option to fight climate change and thinking solar and wind can do it all, when it can’t, Hansen said..."
More than 300,000 of today's coastal homes, with a collective market value of about $117.5 billion today, are at risk of chronic inundation in 2045—a timeframe that falls within the lifespan of a 30-year mortgage issued today. Approximately 14,000 coastal commercial properties, currently assessed at a value of roughly $18.5 billion, are also at risk during that timeframe. By the end of the century, homes and commercial properties currently worth more than $1 trillion could be at risk. This includes as many as 2.4 million homes—the rough equivalent of all the homes in Los Angeles and Houston combined—that are collectively valued today at approximately $912 billion..."
Global Warming, Now Brought To You By Your Local TV Weathercaster. It seems that America's meteorologists are (finally) working up the courage and will to connect the dots and talk about climate volatility and weather disruption. Great graphics from Climate Central have helped them tell the story, as reported by NBC News: "...The friendly neighborhood meteorologist — found in a 2010 poll to be more skeptical than the general public about global warming — has rapidly evolved to not only accept climate change but to share the news with audiences in hundreds of U.S. television markets. Key to the shift has been Climate Central, the nonprofit that helped school LaPointe. The Princeton, New Jersey-based organization sponsors classes and webinars for meteorologists and also shares real-time data and graphics with TV stations. The group has reached more than 500 local TV weathercasters — about a quarter of those working in the U.S. — since it started its “Climate Matters” education program in 2012, and it is expanding this week to a wider group of journalists..."